Future skyline behind Stony Point ShopRite? Approximately 150 persons gathered Tuesday night at the West Haverstraw Community Center for a discussion about a proposed plant in neighboring Stony Point, which would convert New York City trash to natural gas. Greg Julian, chairman of the Stony Point Democratic Committee,was a central organizer of the event, and was joined by many elected officials from Haverstraw. Since the project was first proposed in 2013, most of Stony Point officialdom and public opinion has been behind the plant, while Haverstraw interests have been opposed. Tuesday may mark a change in that trend as Julian has rallied many Stony Point residents in opposition. The goal of the meeting Tuesday, said Julian, was “to make our Hudson River communities aware of the potential harm” of New Planet Energy’s trash-to-gas plant planned for the former K Fries 42-acre parcel in Stony Point. 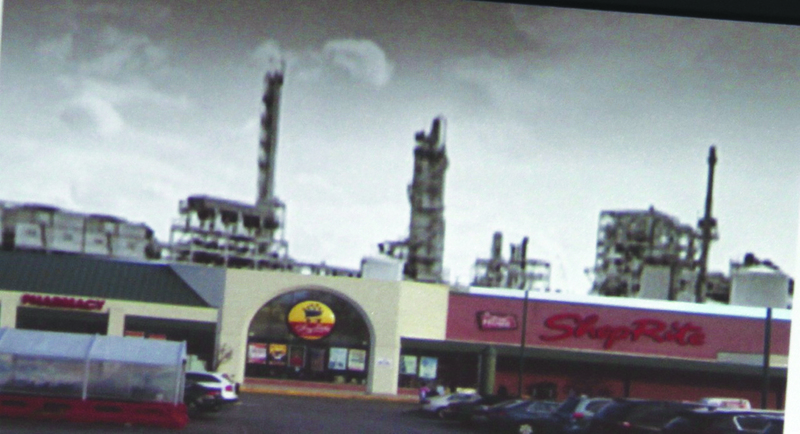 New Planet Energy has been working with the Town of Stony Point to regenerate the 42-acre parcel – a brownfield site that formerly produced Agent Orange in the Vietnam War-era – in the southern part of the town, much to the chagrin of Town of Haverstraw Supervisor, Howard Phillips, who has already filed objections on behalf of the municipality. Phillips was joined by Village of Village of West Haverstraw Mayor Robert D’Amelio Tuesday. The proposed project borders the village. NPE has submitted plans to take in a total of 1.3 million tons of MSW a year and manufacture an EPA certified-alternative fuel, as well as produce 20 million gallons of renewable sulfur-free diesel and other renewable bioprojects a year. Its projected cost is $700 million. John Cruikshank, CEO of New Planet Energy, has been working with the DEC and Stony Point for several years. NPE completed its Scoping Process and submitted its Draft Environmental Impact Statement (DEIS) to the NYS Department of Environmental Conservation, which is lead agency, for review. Among other concerns, the presentation shown Tuesday warned residents that NPE helped build a trash-to-gas plant in Vero Beach, Florida, which eventually failed.